Front view of 2/4/8 channel device. The optimised 10.4 inch display with low reflection allows for perfect visibility even in direct sunlight environments. The display is 180° rotatable and has a touchscreen function. The status LED indicates the operating status of the device. Bottom view of eight-channel device with connector socket arrangement. 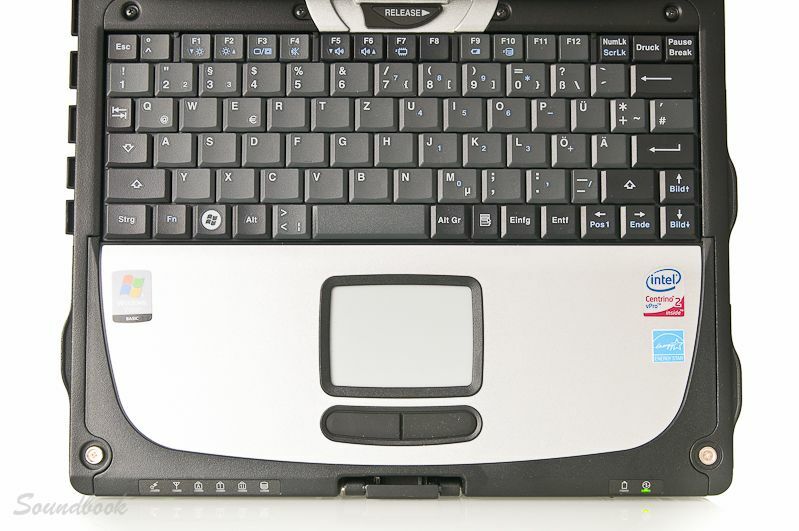 A special drainage system reliably protects the keyboard, touchpad and other sensitive components from splashes and particles. Bottom view of eight-channel device. Soundbook_MK2 is the second generation of our universal measurement system for sound and vibration measurements as well as general engineering measurements. It is based on the innovative Apollo platform. The high-performance 24-bit ADCs and the advanced Apollo filter processor combine highest precision, a large number of channels and a high signal bandwidth in one device. 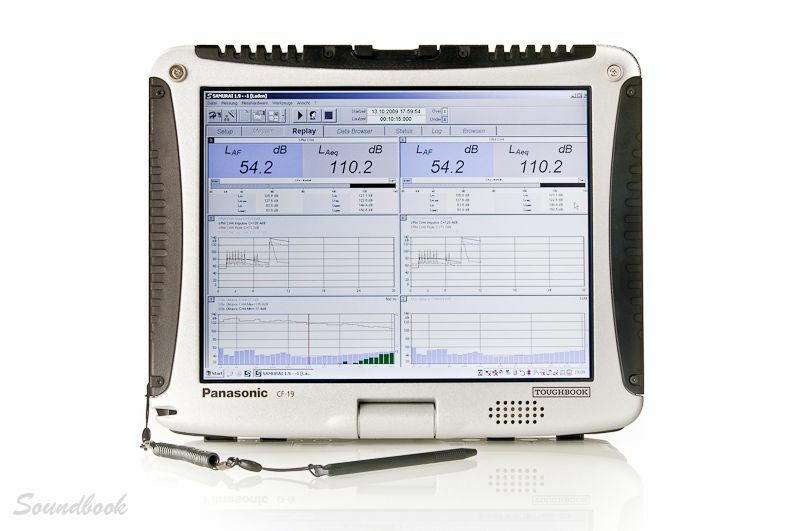 Of course, the robust Panasonic Toughbook CF-19 serves as base equipment for the Soundbook_MK2 again. Soundbook allows you to work virtually everywhere, at the office as well as on the go. Soundbook reliably withstands heat, cold, rain, dust, vibration and hard impacts. With a weight of 3 kilograms, a robust magnesium case, a rotatable, bright TFT display, low power consumption and various interfaces Soundbook combines the performance of a high-quality instrument with the capabilities of a PC. You may choose from variants with 2 / 4 or 8 measuring channels with LEMO7 or BNC input connectors to match you application requirements. 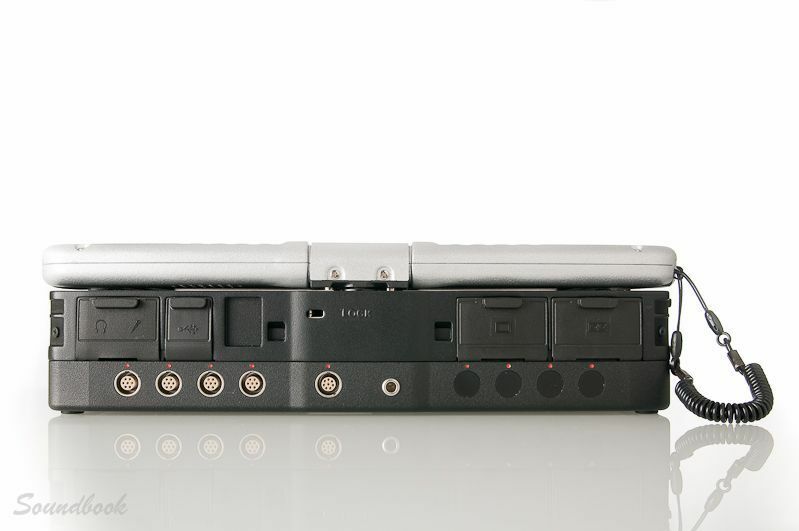 As an alternative we offer the Apollo_Box with 4 input channels for operation with a Windows PC and a USB 2.0 interface or as channel extension to Soundbook_MK2. The Soundbook_MK2 complies with IEC 61672-1 Class 1 and is calibratable with up to 8 measuring channels. The splash-water and dust-protected design ensures durable sealing complying with the IP54 protection class (IP64 CF-19 Toughbook). This also allows operation under hash environmental conditions. 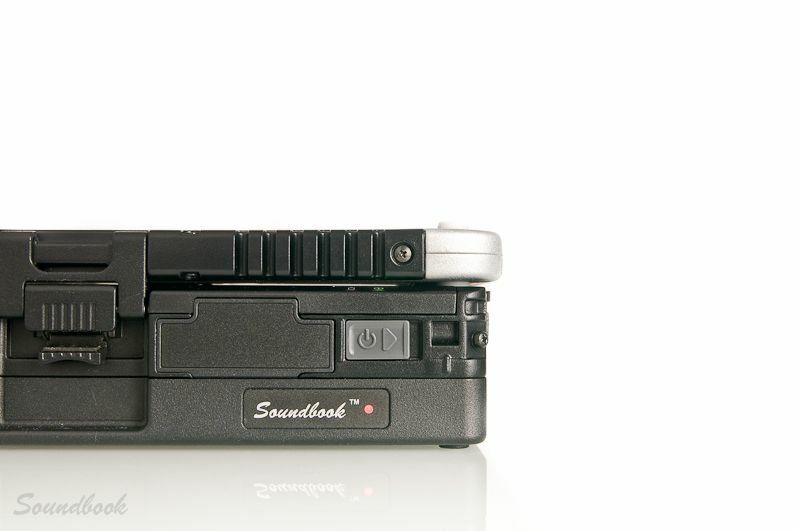 The Soundbook is MIL-STD 810F vibration- and shock-resistant. Offering the perfect combination of performance and robustness Soundbooks is setting a new benchmark for PC-based measurement systems. The Fully Ruggedized Convertible Soundbook has a revolutionary LCD display, which allows use as both a notebook and a tablet-PC. The Panasonic TransflectivePlus display technology featuring low reflection ensures perfect readability even in direct sunlight (up to 6.500cd/m2 reflective brightness). The CF-19's LCD is enclosed in a robust, scratch-resistant magnesium alloy case and connects to the base shell through a reinforced 180°-rotatable hinge. 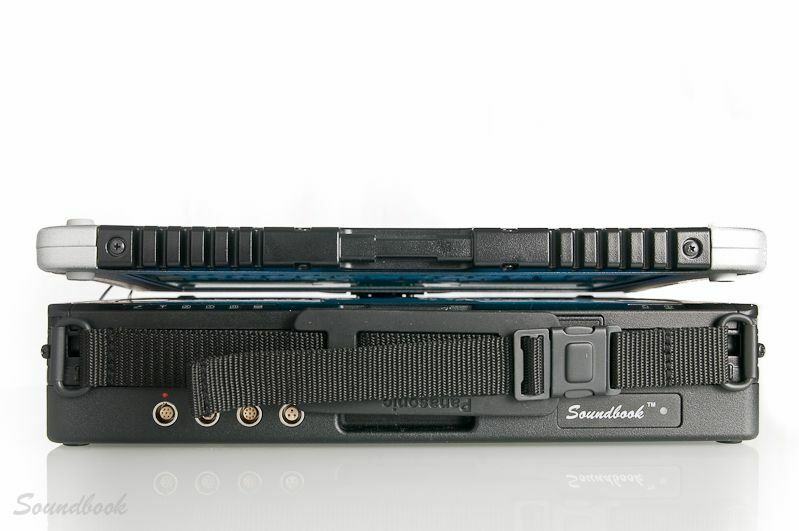 With a height of only 2cm the Soundbook base shell matches the contours of the Panasonic CF-19 Toughbook. Weighing only three kilogrammes and featuring a robust magnesium alloy case, moderate power consumption and various interfaces the Soundbook_MK2 combines a high-quality measuring instrument with the capabilities of a PC. The integrated, high-quality Panasonic Touchbook CF-19 provides you with all functions and interfaces of a traditional notebook. Featuring a 3rd generation Intel® Core™ i5-3340M vPro™ processor the CF-19 offers high performance, while maintaining a low power consumption. 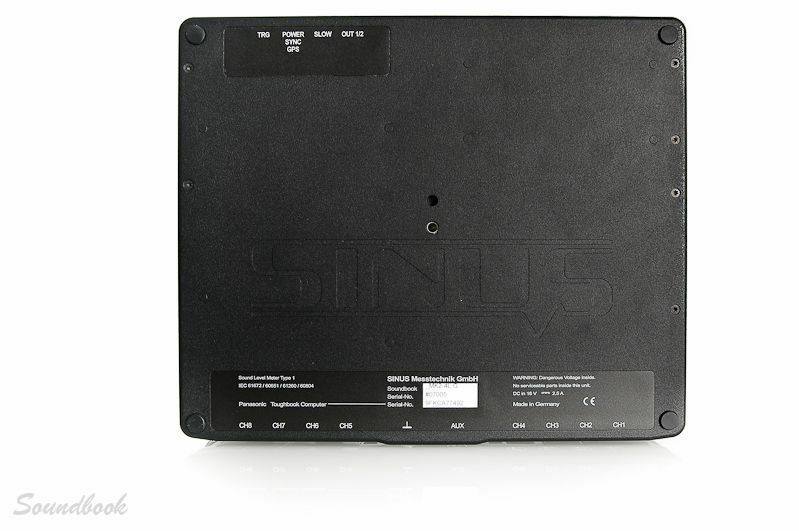 Integrated WiFi, LAN, USB 3, Firewire, PC card type II, ExpressCard/34/54, SD/SDCX memory card, Bluetooth and 4GB RAM allow data post-processing at virtually any place. 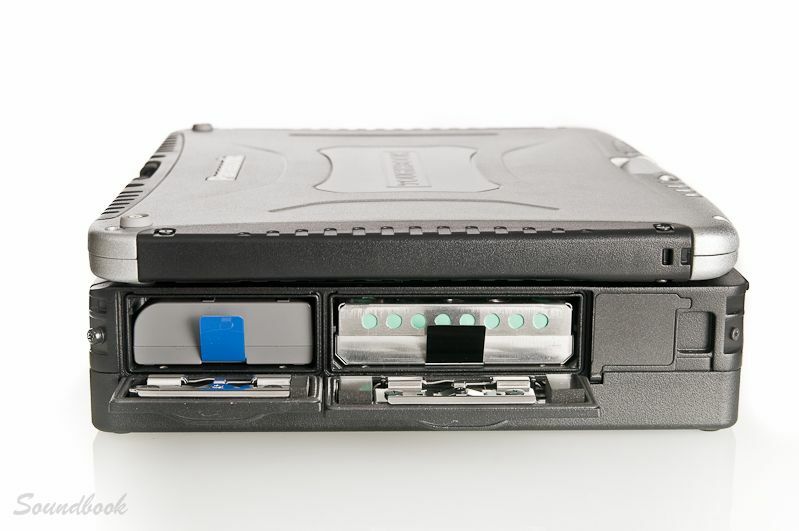 The internal HDD/SSDas well as SDXC and USB 3.0 SuperSpeed interfaces enable simultaneous acquisition of time and real-time analysis data with all channels at full bandwidth for days. 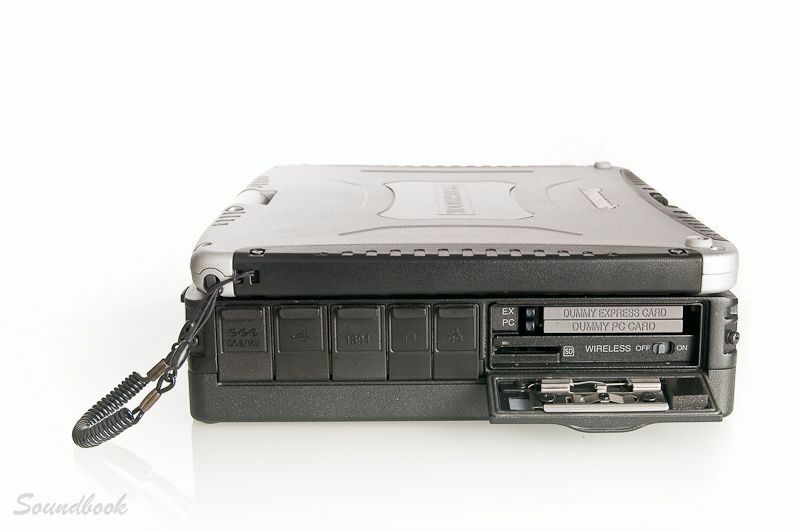 Soundbook's heated, easily accessible 500GB HDD is shock-resistant, withstands drops from a height of up to 1.8m and may be exchanged with an optional 256 GB SSD. Our comprehensive software range makes the extendable, PTB-approved, mobile Soundbook measurement system a universal measuring instruments for most sound and vibration measurement applications. 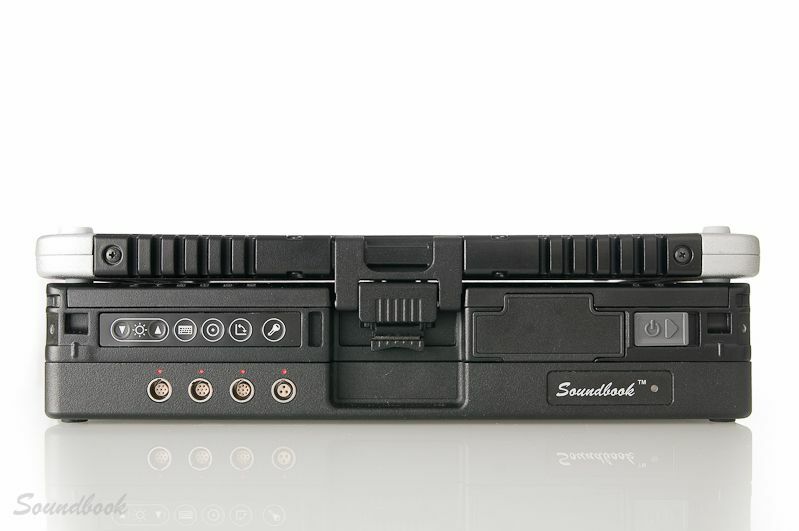 Without power supply the Soundbook_Expander extends the Soundbook measurement system with 8 additional measuring channels and various additional service channels. The Apollo_Sync_Hub allows sample-synchronous operation of up to 4 Expanders and an additional Soundbook. This allows the configuration of measurement systems with 2 to 40 measuring channels for a wide variety of applications. Apart from ICP/IEPE supply the Soundbook_MK2 offers polarization voltages of 20V, 63V and 200V. The additional voltages of 20V and 63V cause an up-shift of the dynamic range by 20dB and 10dB for a polarization voltage of 200V. This eliminates the need for special microphones for high sound pressure levels, provided that the microphone is rated for high sound pressure levels. Soundbook_MK2 offers wired sample synchronisation with less than 0.5° phase difference up to 80kHz. Highly precise GPS pulse synchronisation with an accuracy of less than 25ns allows data synchronisation over a network of measuring stations that are miles apart. Software package for the evaluation and documentation of time-varying environmental noise as well as the evaluation of noise emissions according to TA-Lärm. The following specifications apply to the 8-channel version of Soundbook_MK2_8L (LEMO7) and Soundbook_MK2_8B (BNC). Soundbook versions with 2 or 4 input channels (upgradeable to 8 channels) are also available.